Samantha Gunn competes for Darien High School on balance beam at the Pomperaug Invitational gymnastics meet in Southbury Saturday, Jan. 5, 2013. Never blessed with huge numbers, the Darien girls gymnastics team has only seven members on its roster this season, down from 10 last year. Despite the lack of depth, however, coach Ellie Southworth remains optimistic heading into the season and is looking for a top finish in the FCIAC championship. Junior captain Sam Gunn, a Darien YMCA-trained gymnast who competes for the YMCA's 8/9 travel squad, leads four returnees for the Blue Wave. Gunn was Darien's top overall performer last year. "Though we are small, we will be competitive and will strive to place in the top three at FCIACs, as long as we stay healthy and avoid injury," Southworth said. "There is no telling what to expect at the state divisional meet until we get acquainted with the oppositions' competitive field of gymnasts." Darien finished sixth in the FCIAC championship last year behind Wilton, Fairfield Ludlowe, Trumbull, Staples and Fairfield Warde. Darien graduated Caroline Congdon and Marya von Schmidt, who also were top performers for the Blue Wave last season. Congdon, in fact, was Darien's female recipient of the 2013 CAS Scholar Athlete Award, an accolade reserved for one graduating male and female. In the Class M meet, she posted a posting a 7.57 on the beam and a 7.350 on bars to help the Blue Wave finish seventh. In addition, Julia Murray has decided to take a year off while fellow junior Sarah Morgan Petti opted to leave the team. "Both are Darien YMCA trained gymnasts who compete for the Y's house team, so we will miss them greatly," Southworth said. However, Southworth is confident that Gunn and the other returnees, which include junior Kajsa Lundeen and sophomore Emily Medwid, can help pick up the slack for the Blue Wave. The latter two also were groomed at the Darien YMCA. Lundeed competes for the YMCA at its highest level and took part in all four events at the state meet a year ago. Medwid trains with the YMCA's pre-opt house team. The Blue Wave also should get a boost from senior captain Tiara Vera, who has recovered after suffering a dislocated shoulder last season. "She continues to improve her skills and all around strength," Southworth said. "We look forward to Tiara contributing to the team score on the FX (floor exercise), beam and vault." Darien presents an interesting trio of newcomers in freshman Samantha Aparicio, junior Alaine Connolly and sophomore Tatyanna Concannon. Aparicio, who hails from the Darien YMCA level 8 travel team, will compete in the bars, beam and floor disciplines. 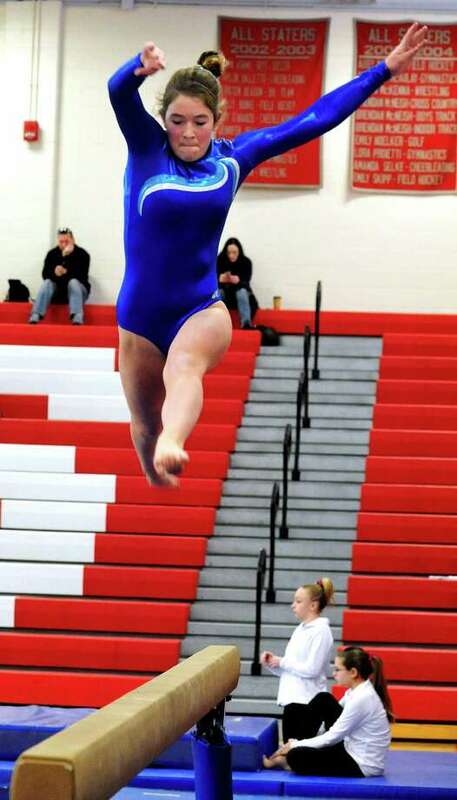 Connolly, a former competitive level 5 gymnast from the Darien YMCA travel team, is returning to gymnastics for the first time since her grammar school days. "Though she has been away from the sport for over six years, we look forward to working with her in getting her skills back and being an all-around competitor for us this year," Southworth said of Connolly. While Concannon has no formal gymnastics experience, she is a competitive Irish dancer. "We look forward to introducing the sport of gymnastics to Tatyanna and hope to have her performing on the floor and beam by January," Southworth said. Darien opens its season on Jan. 8 at Westhill in a tri-meet that also includes New Canaan.